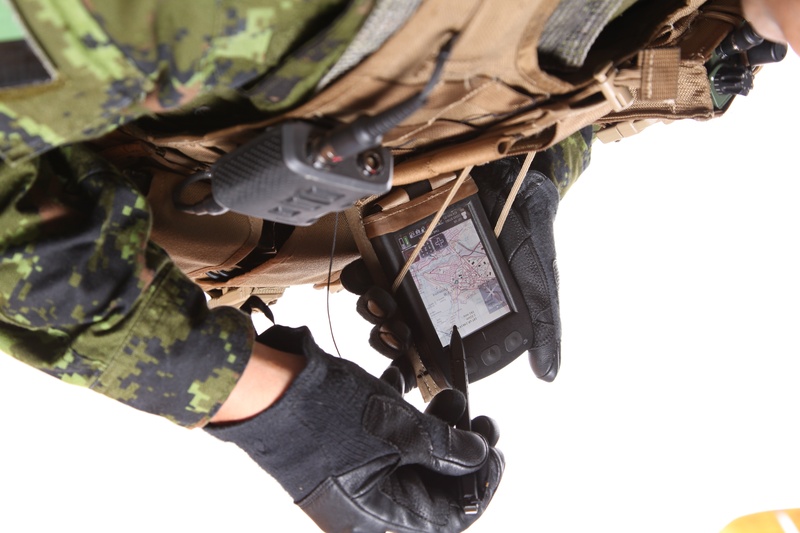 Members of the Canadian Army tested and assessed the effectivity of a mobile communication and situation awareness wearable system designed for the foot soldier in a recent war game exercise that pitted them against similarly equipped opponents. At the U.S. Joint Staff-led demonstration Bold Quest was held at Fort Stewart, Georgia, last fall, Canadian soldiers and their counterparts from 17 other partner nations were outfitted with Nett Warrior (also formerly known as Ground Soldier System) an integrated dismounted leader situational awareness (SA) system for use during combat operations of the United States Army. The system is connected, through a secure radio, to a network. It displays the location of individual soldiers, vehicles, points of interest, and enemy activity on a digital geo-referenced map, and enables communication of voice, data, and location messages. The system provides SA to the dismounted leader. It enables faster and more accurate decisions in the tactical fight. The system features advanced navigation, SA, and information sharing capabilities. With it, soldiers are able to avoid friendly-fire situations and can become more precise in the execution of their combat missions. Dr. Katherine Banko, a Defence scientist from Defence Research and Development Canada’s Centre for Operational Research and Analysis (DRDC CORA), evaluated how the technology impacted combat effectiveness. The first iteration of Nett Warrior was introduced at the Network Integration Evaluation 11.2 assessment in spring 2011. By mid-2012, the Nett Warrior had morphed from a 10-lb Ground Soldier System to one that is based on an “end user device,” essentially an Android or iPhone-like smartphone tied to the Rifleman handheld radio. The device links to command and control networks and uses applications to call in fire support, plan and coordinate operations, and track friendly forces. In 2013, the U.S. Army installed the Samsung Galaxy Note II into Nett Warrior as the system’s end user device. The U.S. Army’s 2016 budget includes funding to field Nett Warrior in three brigade combat teams, increasing information and situational awareness for dismounted platoon, squad, and team leaders. During the exercise, two sections from 38 Canadian Brigade Group and a section from the New Zealand Army formed a platoon embedded into a U.S. company. The troops conducted missions against a near peer enemy force also wearing the same technology. In addition to Bold Quest, Canada took part in the U.S. Army’s Warfighting Assessment (AWA) 17.1 exercise alongside more than 5000 personnel from the U.S., Australia, Denmark, Italy, and the U.K. earlier last fall. The AWA, held at Fort Bliss, Texas, was a virtual combat simulation against a near-peer enemy. The exercise allowed coalition forces to conduct realistic operations to improve how they fight, communicate, and share digital data on the battlefield. As part of the AWA, Emile Pelletier, a DRDC CORA scientist, assessed how the Canadian Army’s 5 Canadian Mechanized Brigade Group used the Land Command Support System in planning and conducting tactical operations. With rugged laptops for the headquarters, radios for vehicles, and forward-deployed soldiers on the ground, the Land Command Support System allowed the Canadian Army to communicate with each other and other nations. “The unique thing about these types of exercises is that they help the operators to work better with their international partners, but they also offer scientists great insight into the evolution and direction in which we should take our scientific research for their benefit,” said Pelletier. A Canadian soldier activates the multiple integrated laser engagement systems (MILES) on a U.S. Soldier during the U.S. Joint Staff-led Exercise BOLD QUEST, a demonstration and assessment that took place from October 24 to November 3, 2016 in Fort Stewart, Georgia.